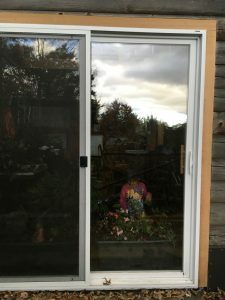 These are the second gerneration of sliding glass doors in this location. The first were vinyl clad wood that had succumbed to frequent soaking with every rain. The wall is victim of water from the drip edge roof above splashing off the deck and onto the wall. Adding the the problem was the installation of both generations. Neither had received proper care so that when the door closed, it actually sealed with the casing. In some cases the casing was installed with high expanding foam which caused the casings to bend and again not seal to the door. Water was splashing through the gap and through rot holes that developed in the adjacent log walls causing the prefinished flooring and the subfloor to rot. You see here the vinyl slider having been reinstalled, plumbed, sealed, and trimmed. Yes, since the previous installation wasn’t plumb, the allowances cut into the logs for trim had to be modified in some cases to accommodate plumb trim. You may have noticed I said nothing yet about dealing with the water coming off the roof. A gutter would be the answer but since the deck is rotted and no longer safe it must be removed. Until a new deck is built, now a later phase of the work, a gutter won’t be needed.